Jim Blake the National Chairman of Concerned Christians Canada and Artur Pawlowski the lead pastor of Street Church Ministries are heading to Ontario to speak at universities, churches and on the streets of its cities. They are prepared to rock the status quo, and to stretch the politically correct norms of speech. They will talk about freedoms within Canada will challenge humanistic views and engage young and old with truths from the Bible. They are preparing to awaken a sleeping throng of believers to the reality that silence in the face of increasing poverty, violence and immorality is no option. “There are sleepy Christians just waiting for the trumpet call. The problem is that the battle has begun, the cultural war has already ensued, but some of the warriors ate too much breakfast, and are too lethargic to fight. Now is the time to rise up and face the culture head on, bringing truth back to the forefront, and reintroducing the nation to its Heritage – Christ,” stated Jim Blake National Chairman Concerned Christians Canada. Mr. Blake and Mr. Pawloski are prepared for the challenges they will face and are well aware that what they will be speaking about will be deemed controversial. Both are committed to encouraging Canadians to exercise the so called “tolerance” that they so often claim to cherish. Tolerance that does not in fact allow all perspectives to be discussed is no tolerance at all. Jim Blake and Artur Pawlowski will be travelling from city to city during the period between Wednesday, March 4, and Sunday March 15. Both men are open to be interviewed by the media and expect to cause a stir. They may be reached for comments at 403-607-4434 or via e-mail at art@streetchurch.ca or nationalchairman@concernedchristians.ca. Jim Blake is the National Chairman of Concerned Christians Canada (www.concernedchristians.ca). Jim has been involved with defending free speech, defending the poor, and advocating for those who have no voice. He advocates for the rights of the unborn and for the traditional definition of marriage, as being between one woman and one man to the exclusion of all others. Jim has been interviewed repeatedly by the media, over the years, on many different subjects and continues to push for moral leadership at all levels of society. Jim has also been guest host on a radio show called Freedom Radio Network and another called Chandler Radio Network, he has also been interviewed by Top Story airing on Crossroads TV. Jim connects with business leaders, politicians, and with leaders within the church community always with one goal – to be salt and light and to bring glory to God. Concerned Christians Canada advocates at all three levels of government for Christian and traditional family values. Jim has personally spoken at leadership conventions, political campaign races, and has spoken with candidates and elected officials on both a one on-one-basis and publicly before hundreds of listeners. Artur Pawlowski is the lead pastor for Street Church Ministries (www.streetchurch.ca) and preaches on the streets of Calgary, 4 days a week. He is the host of an internationally broadcast evangelical production called Evangelism in Action which airs once a week on the Miracle Channel. He has been interviewed repeatedly by the media and has been featured in an award winning radio documentary in Poland. Artur Pawlowski is a well known advocate for the poor and the homeless in Calgary, Alberta and has testified before lawyers, judges, politicians and citizens about the greatness of the Living God. He was arrested for publicly reading from the Bible in a Calgary park. He has faced constant harassment and persecution for several years for preaching on the streets of Calgary. Street Church Ministries has received over 70 tickets and summons relating to the work of feeding and caring for the homeless. The ministry feeds thousands of homeless per month and has helped hundreds to get off the streets, literally changing the lives of drug dealers, prostitutes and drunkards, helping them to get back on their feet in the name of Jesus Christ and by the power of the Holy Spirit. Is nothing sacred? Turbulent pastor jumps to the front of Calgary’s Stampede Parade! July 8, 2012 Artur Pawlowski Comments Off on Is nothing sacred? 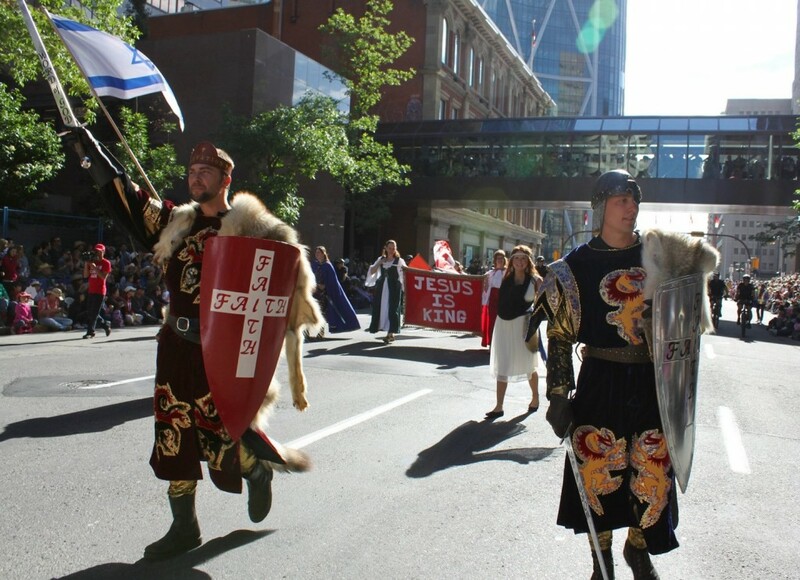 Turbulent pastor jumps to the front of Calgary’s Stampede Parade!